A 24-year-old man who presented with hoarseness of voice was found to have left vocal cord palsy on laryngoscopic examination done outside. 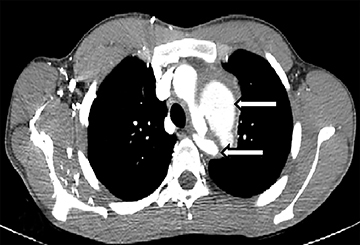 Investigations elsewhere also revealed the presence of an anterior mediastinal mass in a noncontrast-computed tomography (CT), and the patient was referred to the thoracic surgery department for surgery. Following the radiological investigations, on further questioning, the patient had recurrent episodes of painful oral ulcers in the past, which had healed without scarring. There was no history of genital ulcers. There was history of recurrent appendicular polyarthralgia over the last 6 months, with one episode of a nondeforming arthritis. There was no history of ocular inflammation. On examination, the patient had a 0.5-cm oral ulcer and maculopapular and acneform eruption over the upper back and face. Other general and systemic examinations were normal. The pathergy test was negative. He was started on 3 pulses of intravenous methylprednisolone and later was continued on oral prednisolone. He was also given monthly pulses of cyclophosphamide (Table 1). In view of the significant vascular thrombosis, he was anticoagulated with warfarin. A plan to stent the aortic aneurysm at a later date was made. Vascular involvement in Behcet’s disease ranges from 16% to 51%, depending on the population studied.3,4 The 3 main categories of vascular involvement are venous occlusion, arterial occlusion, and arterial saccular or fusiform aneurysm formation.5 Arterial aneurysms occur more commonly than occlusions. One of the leading causes of death in patients with Behcet’s disease is rupture of an aneurysm.6 The most common sites of an aneurysm in Behcet’s are abdominal aorta, femoral, and pulmonary arteries.5,6 Involvement of the aortic arch and descending thoracic aorta is rare.7 This patient’s clinical presentation of hoarseness of voice was caused by paralysis of the recurrent laryngeal nerve due to compression of the nerve by the large saccular aneurysm arising from the aortic arch. Subcutaneous or superficial thrombophlebitis is the most common form of venous involvement, followed by the thrombosis in the deep veins (DVT) of the lower extremities. Incidence of DVT varied from 29% to 39%.4,8 Visceral veins like hepatic veins, inferior vena cava, or portal vein may get occluded in Behcet’s disease. Arterial aneurysms or pseudoaneurysms can be treated with endovascular treatment after controlling the disease with immunosuppressants. In our patient, immunosuppressive therapy had been started and endovascular treatment is planned. In a young male with the presence of vasculitis, involving arterial and venous system, Behcet’s disease is to be suspected. 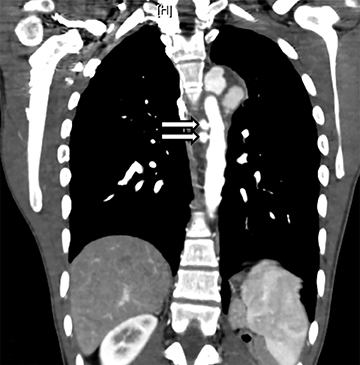 Even when a patient presents with uncommon symptoms, as in this case, suspicion of Behcet’s based on radiological findings would alert the clinician to look for typical symptoms of the disease. Tomasson G, Monach PA, Merkel PA. Thromboembolic disease in vasculitis. Curr Opin Rheumatol. 2009: 21:41-46. Suzuki Kurokawa M, Suzuki N. Behcet’s disease. Clin Exp Med. 2004;4:10-20. Review. Ko GY, Byun JY, Choi BG, Cho SH. 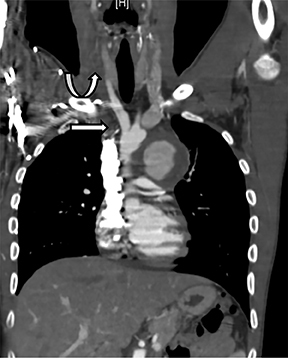 The vascular manifestations of Behçet’s disease: Angiographic and CT findings. Br J Radiol. 2000;73:1270-1274. Chae EJ, Do KH, Seo JB, et al. Radiologic and clinical findings of Behçet disease: Comprehensive review of multisystemic involvement. Radiographics. 2008;28:e31. Epub 2008 Jul 6. Review. Park JH, Han MC, Bettmann MA. Arterial manifestations of Behçet disease. AJR Am J Roentgenol. 1984;143:821-825. Okita Y, Ando M, Minatoya K, et al. 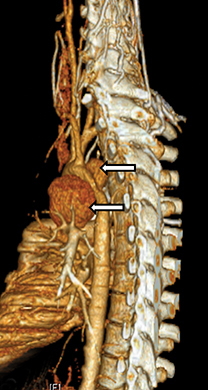 Multiple pseudoaneurysms of the aortic arch, right subclavian artery, and abdominal aorta in a patient with Behçet’s disease. J Vasc Surg. 1998;28: 723-726. Houman MH, Ben Ghorbel I, Khiari Ben Salah I. Deep vein thrombosis in Behçet’s disease. Clin Exp Rheumatol. 2001;19[5 Suppl 24]:S48-50. 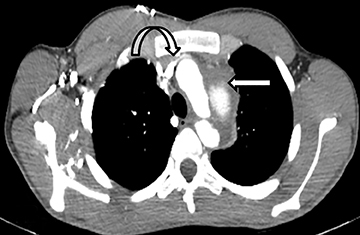 Radiological Case: An unusual case of an anterior mediastinal mass. Appl Radiol. Prepared by Dr. RV, Ms. Dip, Mr. Gnanamuthu, Dr. Jasper, and Dr. Crispal while at the Christian Medical College, Vellore, India.